HeyPlantMan! Exotic Tropical Plants from St. Pete FL: December Breezing In ! Last weekend, we participated in a plant show down in Ft. Myers at the beautiful Edison Estates. 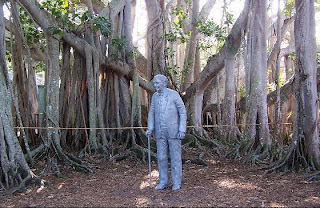 The photo here is of the large Banyan Tree on the property with a statue of Edison under the trees. Customer turn out was less than expected but we had a great time doing the event with some of our great vendor friends, and especially loved the booth from Linda and Dennis of Tropiflora ! By the way, we spent the weekend in a hotel we have never stayed in before, "Homewood Suites" and I must say it was one of the best hotels we have ever stayed in. 2 room suite with full kitchen, full breakfast and beds and pillows to die for ! Highly recommend you check it out for option for your next traveling time. This weekend is looking doubtful for plant sales and rain chances for market day on Sat. is very high so we may have to opt out of market. But you know us..Sunday is suppose to be beautiful, so we may just pop up somewhere around town ! Email us if you have any plant needs that need to be filled by this weekend and we can arrange for pickup in St. Pete. We still have lots of gorgeous Bougainvillea !